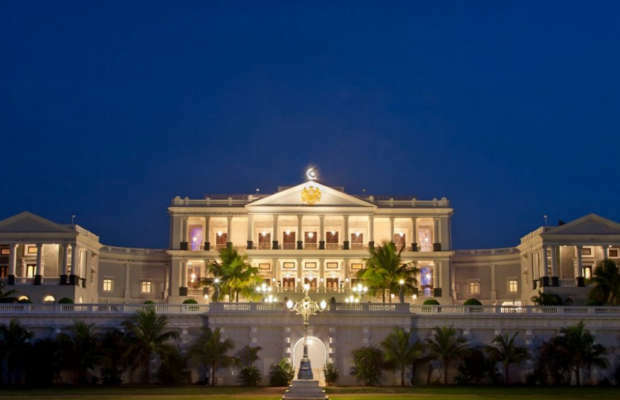 Perched 2,000 ft above the city of Hyderabad, Taj Falaknuma Palace is a five-star luxury hotel spread over 32 acres. Built in 1894, it is the former palace of the Nizam. The hotel offers 60 rooms and suites. Each room provides views of the palace courtyard and the 400-year-old city of Hyderabad. The hotel features Indian fine-dining restaurant, Adaa, and a multi-cuisine restaurant, Celeste. Guests can enjoy breakfast and afternoon tea on the Jade Terrace or private dinners at the terraced Gol Bungalow with a night-time view of the city. The Durbar Hall, Jade Room and 101-seater dining hall bedecked with Belgian chandeliers, and assorted gardens and terraces serve as events and business meetings’ space.